Before discussing sweetness and satiety, definitions are required. 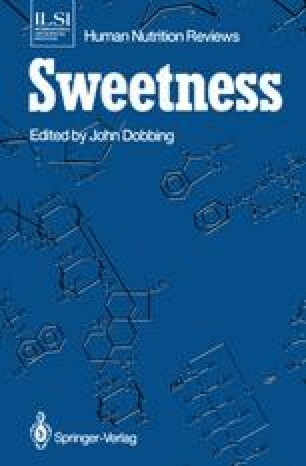 Sweetness encompasses the sweet taste associated with the various sugars, intense sweeteners, and heavy metal halides. Satiety according to the common, dictionary use refers to a glutted, unpleasant state following consumption of too much of something. However, satiety may also refer to a positive state which occurs as hunger is relieved. In scientific studies satiety generally refers to the graded termination of eating. As eating proceeds individuals start to feel full and that they have had enough, i.e., they are satiated. The preference or liking for the food being consumed declines, but interest in food can often be revived by offering another food. Thus satiety may refer to both a change in the palatability of foods, i.e. the hedonic response to foods, and to the satisfaction of the physiological need for food. In this review I will first discuss the changing hedonic response to sweetness and will then discuss the ability of different sugars and intense sweeteners to satisfy hunger and reduce food intake.